Real projects usually are not linear: When many developers work on code, parallel branches are the rule. Git allows you to store your code branches in a repository (repo), and even changing the directory structure does not cause any problems. The example from the first part of this series  comprises three text files located in a local repository, which is usually sufficient just to manage files. However, if you work in a team, being able to link your project to a remote repository has advantages. The corresponding git commands you will use are clone (create and check out a project), push (transfer data to the remote repository), fetch (get data from a remote repository), and pull (get and merge data). In this context, the term "data" represents the linked or specified references and objects in the Git index. Figure 1: Determining the status of a project. The current branch is illustrated at the bottom. The project contains four commits arranged on a timeline. With the exception of the first commit, each is based on its predecessor. This line is known as a branch. The HEAD is a pointer to the version on which the current working directory is based (i.e., the end of the checked out branch). The entries named origin refer to the remote repository from which you cloned the project – in this case, the origin remote repository. The information reflects the status of the last synchronization. The names master (for branches) and origin (for the repository that is the source for the local repository) are defaults that Git assigns if you do not make any explicit specifications. Branches allow concurrent development. Typically, the main branch contains the completed or already delivered versions; further development takes place in other branches. Ideally, each task has its own branch with a meaningful name. Once you have completed the changes in each branch, you transfer them to the main branch and test them, and the new version is ready. Git acts as a decentralized version control system. You can create branches without a connection to the remote repository and transfer them back later if necessary. Furthermore, Git treats all branches equally. The known commands work as usual and as speedily. Figure 2 shows a project with the master and mybranch branches. The master branch contains the finished versions MA and MB; development takes place in mybranch, which already has the intermediate versions ZA, ZB, and ZC. Figure 2: Branches divide a project into units, which you can complete and then add back to the main branch. You should regularly check whether all files are in the Git index by running git status or cloning to a test directory. Git offers another approach of saving the changed data with the git stash command, which occurs in a special area of the local repository. You can import the changes into the working directory at any time, regardless of the version checked out. For more details, see the corresponding man page (i.e., git stash --help) and the online book Pro Git . Git creates the branches in the local repository. To include them in the remote repository, you need to create an appropriate link. The push command from the first line of Listing 1 creates the link and starts the data transfer. This is followed by both branches, master and mybranch, in hot pursuit. If several people are working on a branch or you want to make a backup copy of the branch, transfer the branch to the remote repository. The git branch -a command displays the local and remote branches. Anyone who has the appropriate access rights can check out these branches. Cloning puts all branches contained in the remote repository on your disk. If you do not specify a branch, the working directory contains the latest status of master. Branches checked out of the remote repo always have the status tracked. Make your changes on the branch as often as you like. If you reach a good version, merge this branch with the master. Merging merges the changes from branches. 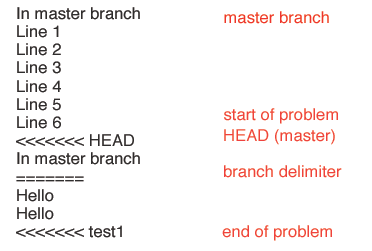 In Figure 2, mybranch is derived from the last commit of the master branch. Because no changes to master have taken place, the blue path describes the merge process performed with the commands in Listing 2. In this case, Git shifts the HEAD pointer to the last commit in mybranch. This process is known as a fast-forward. After merging, both branches have the same status. If master changed in the meantime, Git searches for the changes (a three-way comparison) from the common starting point of both branches (in this case, MB) and tries to synchronize them. If the changes are in different places or affect different files, everything works as described. The software checks in the new version resulting from the merge as part of the process. Unless otherwise specified, Git starts the editor, so you can enter a corresponding message. move the resulting state into the Git database. Figure 3: Merge problems: The software does not have a solution, so the only option is to examine the differences manually and then adopt the desired version.